To schedule your basement waterproofing quote free of charge and with NO obligation, contact us today! We serve throughout Vermont and New Hampshire, including Colchester, Keene, Burlington, Laconia, Rutland, Bennington, South Burlington, St Albans, Montpelier, Brattleboro, Lebanon, South Woodstock, Claremont, Concord, Milton, Berlin, Hanover and many surrounding areas nearby. 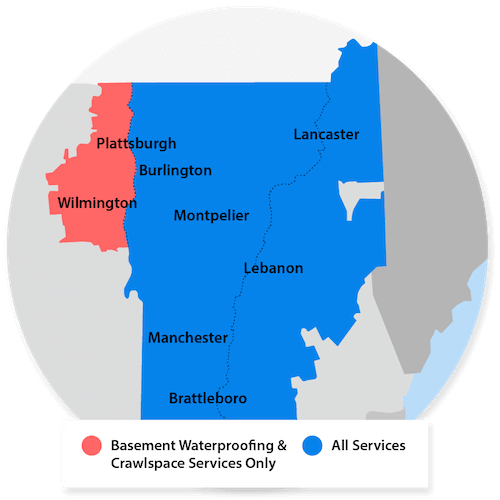 Whether your hatchway doors are leaking or you have some other basement flooding problem, your local waterproofing experts at Northern Basement Systems have the solution you need. From leaky hatchways to flooding floors, iron ochre issues, wall cracks, or even ugly basement windows, we have it all! We serve the Vermont and New Hampshire area, including Keene, Burlington, Colchester, Rutland, Laconia, South Burlington, Bennington, Brattleboro, St Albans, Montpelier, South Woodstock, Lebanon, Concord, Claremont, Hanover, Milton, Berlin and many nearby areas.